Weather permitting, don’t miss your chance to experience an amazing annual event that takes place tonight. Just after sunset the moon will be magically transformed into a giant ball of glorious orange gracing the night sky. Lunar Energy is a powerful source of energy healing, and a full moon is a perfect opportunity to activate your chakras. This Harvest Moon may well be the best of all. With its unique properties, the moon has been endowed with names to capture its monthly lunar transition. For me, nothing quite compares to the Harvest Moon. I hope you’ll take advantage of this rare and wondrous opportunity to join me in meditation under its glow. 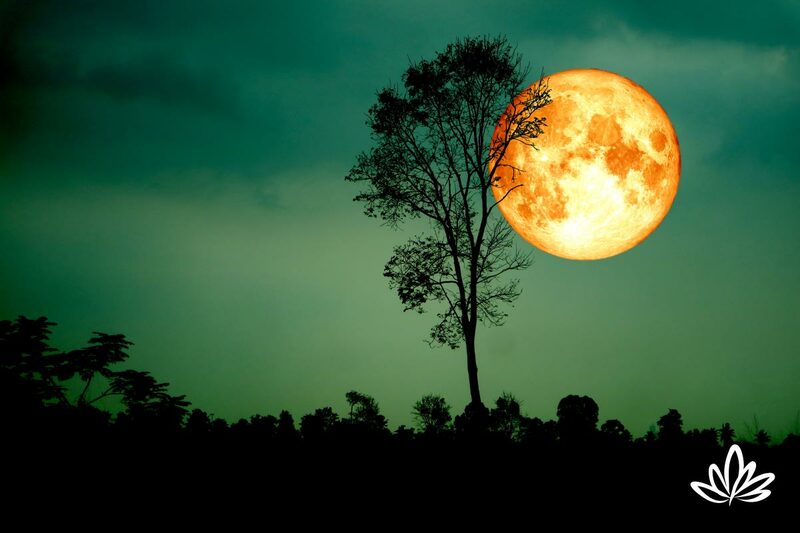 Harvest Moon is the name given the full moon that is closest to the Autumnal Equinox that occurred just a couple of days ago, this past Saturday. Year to year, it can be up to two weeks before or after, and while the Harvest Moon typically is in September, it can also happen in early October. What’s unique is that unlike any other time of year, for a few special nights the moon rises earlier than usual, just after sunset, giving you a perfect evening of moon gazing. We’re treated to a visual feast and a spiritual reawakening all in one. For a spiritual teacher, it’s hard to ask for more. This is the night sky at its most romantic and dramatic, affording us a connection with the fullness of the season and the bounties of the earth. Since ancient times, the Harvest Moon has been revered and central to our celebration of the seasonal harvest traditions timelessly binding our cultural and spiritual fabric. This annual celestial event is one of nature’s great visual displays but what we see only hints at the role it has played in different cultures around the world. In the Northern Hemisphere, it signals the beginning of autumn. Many believe the origins of the Harvest Moon date back to Europe in the 700s. In the centuries since, observances and cultural traditions have been recounted around the world. Two are particularly intriguing. In China the Harvest Moon is celebrated with a festival where games are played and delicious treats, ‘mooncakes’, are enjoyed. Due to calendar differences, the Chinese call it the ‘August’ Moon. In America, the Algonquin Indians, among other indigenous tribes, not only celebrated the Harvest Moon but put its unusual brightness to work. Like Mother Nature’s flashlight, they used its light to harvest crops well into the night. What we see is bigger and bolder than usual, and the moon’s surface appears warmer and a vibrant orange. An optical illusion that is the result of the moon’s positioning, the Harvest Moon’s remarkable brightness occurs because we’re viewing it through the lower, and thicker, part of atmosphere. While the moon’s color is inarguably more intense, and it appears larger and warmer, as it rises through the night, the moon will appear smaller and cooler. For those of you who like to plan ahead, a truly rare event is when the Harvest Moon falls on the night of the Autumnal Equinox. This wont won’t again until 2029, but let’s start planning now! Next up, however, and usually in October as it is this year, is the Hunter’s Moon; the first full moon after the Harvest Moon. It also features unique color, this time red, not orange, and it’s known as a Blood or Sanguine Moon. Wherever you are, I urge you to get outside, even if just for a few minutes, and bask in the lunar energy on display and become part of a celestial event celebrated around the world for millennia. And no worries of you miss it tonight – there are encore performances for a few nights after that are nearly as spectacular. Separated by the miles, we’ll be together in spirit.